It was another long day: up early in New Jersey, spend a few hours at a customer’s facility trying to keep their decrepit old equipment performing acceptably, grab some lunch, go to the airport, take a ride at thirty thousand and just barely doze a little enroute, then land in Nashville, pick up my luggage, then head to the rental car garage. A little bit of a walk, but at least Nashville’s airport doesn’t make you lug your heavy gear on and off a bus to get to the cars! This is followed by the usual drill: walk up and down the aisle trying to decide what to drive. Maybe I’ve been doing this too long, but lately I’ve become rather jaded about the rental cars I choose. Being a big-and-tall type, I need plenty of headroom. I also really prefer cars with ‘smart keys’ because the traditional rental car way of having both keys tied together on a loop of steel cable means that one key dangles against my knee, which is REALLY annoying. So I walk into the aisle and as usual, the first thing I see is a display of fancy cars that can be had for an upgrade fee, which my office won’t pay. Right in the middle of the fancy cars was a white Mustang convertible. I know that those are generally within the range I can choose with my Executive Elite status, so what’s it doing in the fancy section? Maybe it’s a GT or something; I didn’t think to investigate as I said to myself that it sure would be a nice car to try out. The Gods Of Vroom must have set me up for this, for just as I was putting that out of my mind, there it was: a black-on-black Mustang Convertible, right there in the regular part of the aisle. A black-on-black convertible? I guess even Darth Vader goes to the beach once in a while. The open trunk beckoned me to see if my gear would fit. 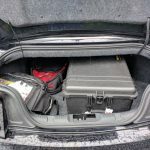 I’d passed on a hard-top Mustang before because I thought the opening looked a little small, and this one looked small too- but the Pelican 1620 case that contains my professional equipment was just able to slide in. The backpack-toolkit went right next to it, and so did my small personal bag. A surprising amount of other stuff would have been able to fit, just as long as it’s not particularly bulky and can be squeezed into the odd remaining peripheral spaces that the larger stuff can’t get into, such as an area across the forward end of the compartment that has reduced height due to the space above required for the compartment into which the roof retracts. 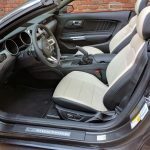 If soft luggage is your traveling-style, you’ll definitely be OK. And besides, this car really only has room for two people to travel in any degree of comfort (more on that later) so you needn’t worry about a whole family having enough luggage-space. With gear stowed, I took a seat and found that after adjusting the seat, headroom and legroom were more than enough for me. It took a moment to get familiar with some of the controls though. Most cars that use a smart key have an ignition button located on the dashboard to the right of the steering column. 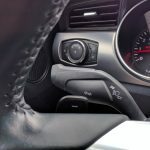 In the Mustang however, the button is down low just above the center console, but still an easy reach once you find it. Next to the start/stop button is a row of switches that control various system-modes (more on that later as well). 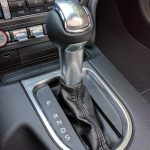 The gear-lever is pretty straightforward, a simple stick with a round knob topped by a detent-button that sort of resembles a chromed version of one of those red covers that protect toggle-switches in action movies. The lever has the usual PRNDS…waitaminnit, S? More on that later too. But at that moment, the sun was already setting and I had two and a half hours of driving ahead of me, so pull it into D and hit the road. I’ll admit that I can’t recall that I’ve ever driven a Mustang before. My brother had one a long time ago, but it was a decrepit baby-blue ’79 with four cylinders and an automatic. Chevettes routinely smoked it, and he often joked about ‘that awesome Mustang acceleration.’ I don’t think I ever drove it; I probably refused on principle. My aging ’83 Accord was much more fun. This modern Mustang felt comfy right away, easy to point down the road and keep between the lines. I surmised fairly quickly from the middling acceleration that it was a V6, par for the course in a rental-fleet version of a performance model. Not a slouch but no screamer either. But the next day I was at low speed and tickled the go-pedal a little oddly…was that a faint whine I heard? My curiosity piqued, at the next opportunity I took a look at the engine. Sure enough, that was a whine I heard: no V6, this powerplant was an Ecoboost turbocharged four-cylinder. Call me impressed. I would never have suspected a turbo-four, or a turbo-anything for that matter, because the power is so smooth and well-modulated that it doesn’t feel like a turbo at all. No weird power-curves from ballooning boost. No turbo-whine unless you’re at quieter speeds, have the top down, and tickle the engine just the right way and even then it isn’t very loud or distinctive. If you don’t like driving turbos, you’ll probably like this one. But back to that first drive. The sun was setting and rain was threatening and I had some miles to make, so leave the top up and go. The driving was easy, but the soft top wasn’t very well noise-insulated, so when I passed trucks I double-checked that all the windows were up and the top was locked in place, because the noise was much more than I’m used to in closed cars. As for temperature, the top is quite well-insulated. 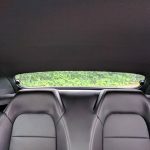 On a 94-degree-day I felt the underside of the top in several places and it felt a nice neutral non-descript ‘room temperature’ in all of them, and the air conditioning was able to keep the car cool. Top down and things get even more fun. 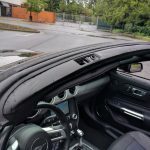 With the convertibles of the ’60s and ’70s you’d get a good strong blast of air to the back of your head, due to the eddy of wind that curls over the top of the windscreen and the fairly low rear deck. With this Mustang, however, the windscreen is long and shallow-angled, and the rear deck is fairly high in relation to the cockpit, and so the eddy is minimal. Most short-haired people won’t get too seriously mussed, although a hat still helps- as long as you’d rather have hat-hair than wind-mussed hair. 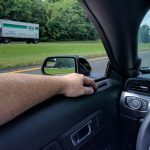 This aerodynamic trick also means that if you raise all the windows, a surprising amount of air conditioning stays in the car. Just the thing on a day when you want to drop the top but it’s dang-hot. Lowering the top is really simple and quick. There’s a locking-handle in the center, right by the edge of the top, and a slide-button between the overhead lights above the windscreen. Pull the handle to hinge it down, then give it a 90-degree twist, then push and hold the button rearward to make the top retract. The whole process takes ten seconds. 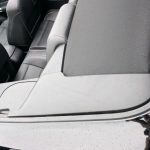 If you’re the fastidious type, in the trunk you’ll find a pair of plastic covers that snap over the openings left on either side by the retracted top. To raise the top, simply reverse the process, and it takes the same ten seconds. The car does have to be stopped to perform either operation, but it does not need to be shifted into Park. 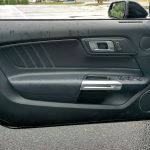 One strange quirk is that when the locking-handle is turned in either direction, the radio temporarily mutes for about a second. I have yet to figure out why. The front seats are comfortable and supportive, although they have minor quirks. They have electric adjustment for fore and aft movement, but manual back-angle adjustment. 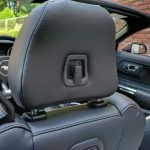 There is also an electric lumbar-support adjustment, and with this one I actually needed to use a little support, while with most cars I’m most comfortable with the lumbar-adjustment at the lowest setting. 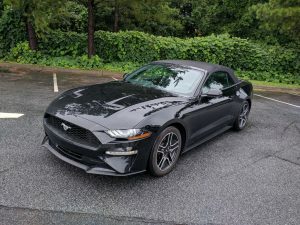 The seats are also vented and can deliver either heat or air conditioning, although this feature worked much better in the first Mustang I drove than in the second one, which wasn’t as good as the third one (yes, I rented three Mustangs before I completed this review). I cannot comment on the comfort of the rear seats, as they appear somewhat cramped and have insufficient legroom for any use unless the front seats are adjusted for really tiny people. 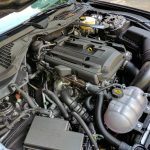 But their mere presence, along with their safety-belts will, in some places, get the car a MUCH lower insurance premium than it would get if everything else was the same but it only had two seats. The rest of the interiour is stylishly appointed, with a look that is reminiscent of the Mustangs of the ’60s. It looks good overall but I do have some minor niggles about it. The second car I drove had cream-coloured inserts in the seats, and the inserts in the door trims should have matched. Also there’s some large silver trim on the dashboard which has a false ‘brushed’ look, which runs diagonally, and the diagonality of just seems a little awkward to my eye- but it’s better than plain old satin-finished silver paint, which is more at home in a Hyundai. At night you’ll notice coloured illumination in all the usual places, plus accent lighting in the footwells and the door-handles. If you don’t like the lighting, you can dig into the extensive menus and change the colour and brightness, and not everything has to be the same colour. For example, the instrument lighting and the ‘halos’ around the two big gauges can be independently coloured. Green numbers and purple halo? Orange numbers and green halo? Everything blue? It’s all possible. The instrument labeling is a bit much though. The tachometer has REVOLUTIONS PER MINUTE spelled-out on its face, and the speedometer’s face is labeled GROUND SPEED. 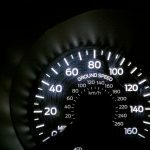 If you have any doubts about where you’re speed happens in a car, you have bigger problems than how fast you’re going. 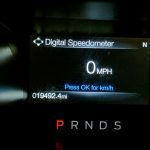 One of the screens that can be selected for the display between the gauges is labeled DIGITAL SPEEDOMETER, which is really obvious anyway. I can’t help but think that whoever was in charge of the labeling spent their childhood enthralled with the labeling on all the devices in the Bat Cave from the Adam West era. The aforementioned menus for the dash display will take you through a plethora of various readouts and functions, every number a performance-enthusiast could want plus a bunch more. Then there are the switches next to the start/stop button. 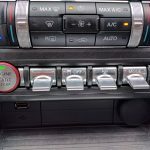 Among them is a MODE switch, which allows you to toggle between several driving-modes such as Sport, Sport+, Track, Dragstrip, and Rain/Snow. I only tried the first three. Sport sharpens the throttle response and raises the shift-points, and honestly, isn’t that much fun in ordinary traffic as it can make the going rather choppy. Sport-mode demands a lot of smoothness in your technique, which is something any race driver will tell you is needed to drive fast well. Track-mode seems to be about the same as Sport+ mode, but adds disabling the traction-control. I’m guessing that Dragstrip-mode enhances off-the-line performance, but how serious can this be in a comfortable car with an automatic transmission? Next to the MODE switch is one that selects between three steering-feel settings, Normal, Sport, and Comfort. Sport provides the most resistance in the steering and comfort provides the least. I found the resistance in Sport to be heavy and obtrusive. By contrast, I found Comfort-mode to be best, even in spirited driving, because the low resistance made it easier to steer precisely and without spending so much attention noticing the heaviness. The S position of the gear lever seems to be yet another sport-mode, so be smooth or just leave it in D.
One thing that did seem a little odd to me is that the stalks on the steering column and the screen for the radio and other systems are the same ones I’ve seen in the Fusion, as is the audible warning that sounds if you leave the lights on or open the door with the ignition on. To me, this cheapened my perception of the Mustang slightly, especially since the screen is very plain and lacks any real graphic style. 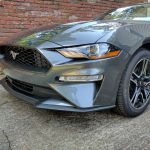 On the other hand, there are some high-style touches like the illumination of the MUSTANG lettering in the door sill, or the Mustang-logo that is projected onto the ground from underneath the mirrors when you get into or out of the car at night. I know, not really very functional, but it does get your attention. The reverse-camera is quite good. 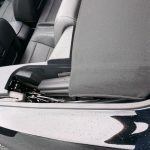 You won’t need it much with the top down, but with the top up, rearward visibility and blinds-spots are both terrible and the camera then becomes quite welcome. So you’re strapped-in, the top is down, and the road beckons. 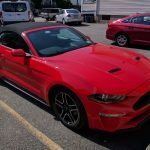 Driving the Mustang is enjoyable, generally easy, and it kept me interested. Acceleration is decent enough for most people, and if you want more, there’s always the GT. This car is smooth and the handling was quite satisfying, and while it feels solid, it doesn’t feel like you’re maneuvering 3500 pounds. The steering is direct enough to be sporty without being twitchy, and the brakes are definitely able to slow the car as much as you need. You can really get into taking the curves, and the seat-bolsters will hold you in place for them. Turn up the radio, put your arm on the windowsill, and eat up the miles. I drove on the Interstate for hours with the top down, and alfresco motoring at night is a real treat. 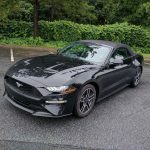 Ford claims 20/28/23 MPG for the Ecoboost convertible, so it does have a thirsty side- but while it’s thristier than the Ecoboost Fastback, it’s more frugal than the GT Fastback (no figures available for the GT convertible). All this fun does not come cheaply though. 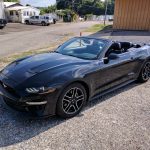 The Ecoboost Premium Convertibles I drove start around $37000, although I would probably trade the $1500 10-speed automatic for the no-extra-cost 6-speed manual, then put the difference toward the $2400 Ecoboost Performance Package. If you want the 5-litre V8, you’ll have to spend around $45000 for the GT. There’s a real plethora of wheel and tire options available too. If you want to get REALLY serious, for $57000 you can have the Bullitt edition, which includes some chassis and suspension upgrades and a limited-slip differential, among other goodies. I enjoyed these Mustangs enough that if I had room in my garage and my wallet for such an impractical car, I’d be very tempted to take one home, and I’ll be sure to grab one again the next time the opportunity presents itself. You should as well. 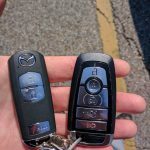 Keys are chunky, shown with sensibly-sized Mazda key for comparison. This is a car you can enjoy. Rear seat is too cramped and devoid of legroom to really be a seat. Groundspeed? Where else is it going to speed? With top down, there’s this opening. Opening gone with snap-in plastic cover. Good cockpit, reminiscent of Mustangs of the 1960s. Cargo space is good, but soft luggage is needed to take maximum advantage. Rear visibility is not much. 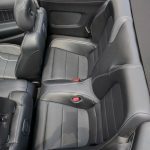 On cars with contrasting seat-inserts, the insert in the door trim should match the seat inserts. 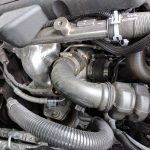 The turbo that almost fooled me. You won’t believe how well-mannered it is. The mode-switches are fun to play with, but you’ll soon find your preferences. 2.3L Ecoboost four-cylinder, good for a claimed 310 ponies. The cream inserst add an attractive touch. Switch-gear common to multiple Ford products. It reminded me of the Fusion. Aggressive styling, but it still looks like a Mustang. 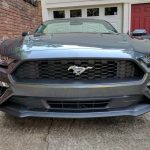 Does this Mustang look angrier than a ’59 Dodge? A nice touch, but with no rear-seat legroom, you best not hang anything very long from this hook. How cool is this? 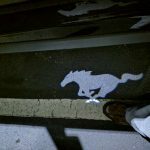 The car projects Mustang-logos on the ground when you open or close the doors. It looks good in red too.